I love homeschooling math, not because I am a math guru or even particularly good at it, but because it usually comes with a very logical series of steps to follow and lessons to complete. As a homeschool mom I sometimes feel completely overwhelmed with the idea of picking and choosing curriculum or making up something on my own. Some of you may know that we are using Math Lessons for a Living Education for math this year for our kids, but one of the biggest questions I get asked is what about kindergarten? 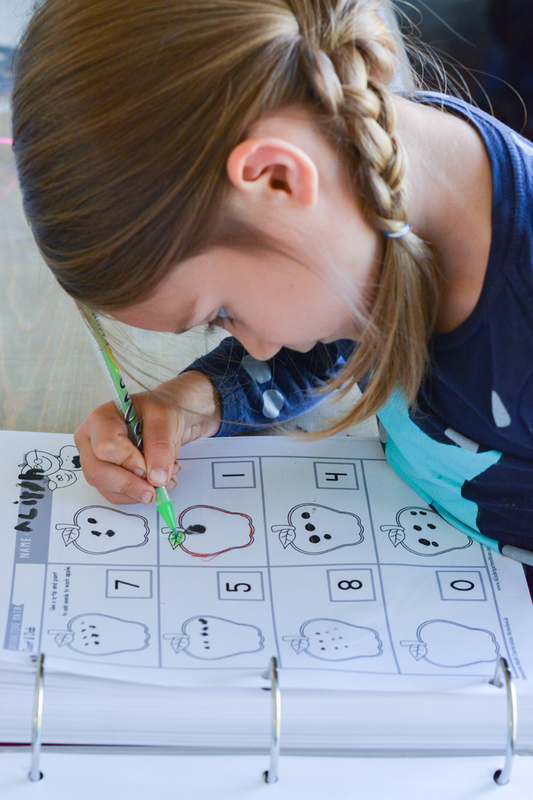 What if your child isn’t ready for a level 1 or grade 1 math and needs something to help them learn their numbers, shapes, and some foundational skills? Up until now I haven’t really had a solid answer to give you other than count with them, do some online apps, and add in some flashcards and stories. Today, that all changes and that is because The Crafty Classroom released their newest curriculum: Interactive Math: Kindergarten. Come take a peek inside and stay tuned for a special offer! One of my favourite things about The Crafty Classroom is that they bring in art into nearly everything they do. Whether it is cutting and pasting or colouring or painting… there is some sort of interactive, hands-on component to the lessons. For Kindergarten, not only is this a huge bonus, but it is really a critical building block of a successful curriculum. It helps to hold their relatively short attention spans and helps give them some tangible way to express or visualize the concept they are learning. The daily lessons are short, involving a daily review time, a lesson worksheet and a hands-on activity or game to reinforce what they are learning. It is based on a 4-day school week which offers homeschool parents a lot of flexibility to fit it in however that works for them. Every 5th week has built in review to help send all those concepts to long term memory. 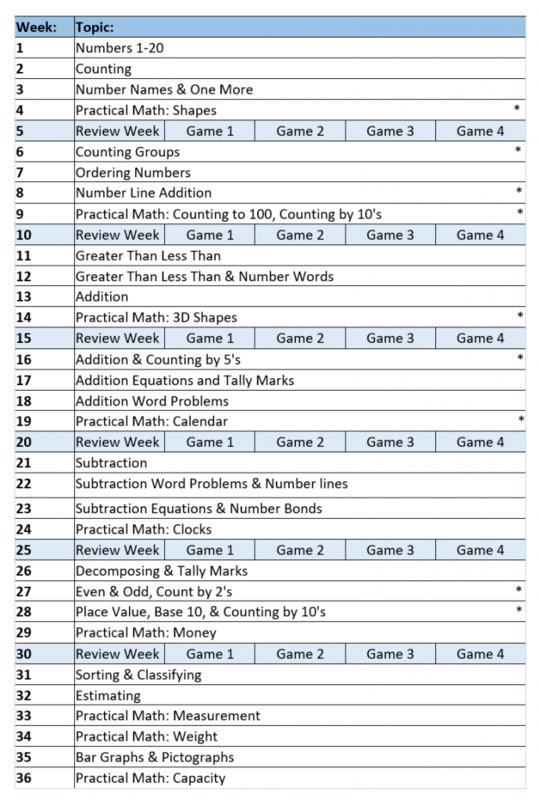 And yes, this is a full 36-week 1 year kindergarten math curriculum. Simply open and go! The front of the book has all the printables you need to create your own daily warmup folder. This gives you and your child time to go over the things that are being taught, through repetition and both verbal and visual cues children begin to truly master the idea of shapes, place value, left and right, addition and subtraction, time and more! 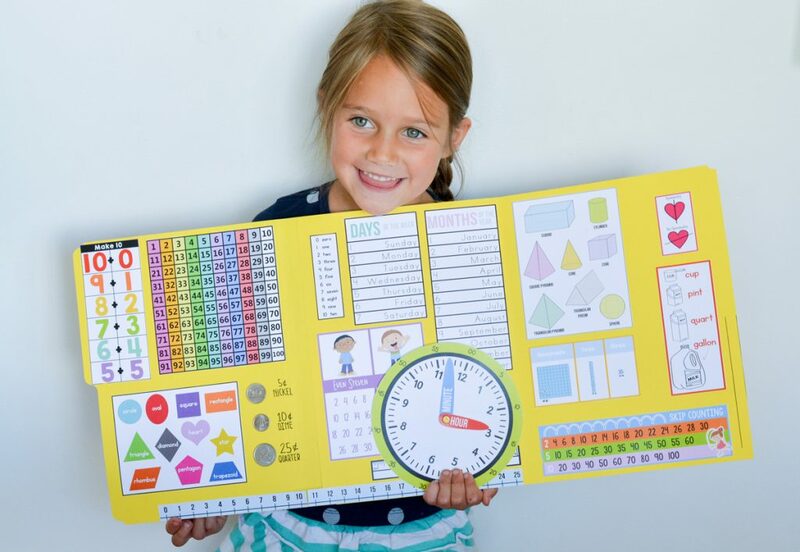 The back of the book has printable manipulatives and resources that you might want to use including a calendar, 3D shapes to cut and create, and even some extra worksheets! The fact that there are only 2 pages a day and that it is all laid out for you makes this easy, fast to do, and fun! If your child is 4 or 5 and has the ability to hold a pencil and copy their numbers, they are ready to give this math a try! After reading over the outcomes for this program, I’m super impressed. There are definitely grade 1 skills that are introduced but because it is done in such a light, fun way, it isn’t overwhelming for the child. Take a look at what this kindergarten math curriculum covers in just one year! What makes this Kindergarten Math curriculum different? There are four quarters worth of review materials that you would add to your warmup folder as you add new concepts to your repertoire. The daily warmup only takes about ten minutes and is a fun no-pressure method to help assess where your child is at, what they are struggling with and what they might need more work on. The curriculum is designed to be printed in black and white with just a few of the manipulatives and your warmup folder in color, which saves money at the printer. All you need is a home printer or a local print centre and you can get started on this math today! The PDF download saves you money on shipping but also saves you time waiting for it to arrive. 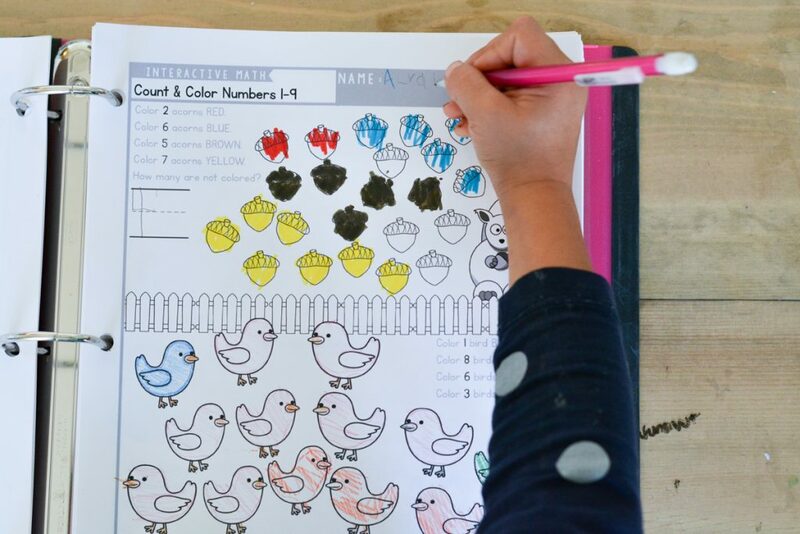 If you have a 4 or 5 year old who isn’t ready for a traditional math program, maybe needs more help learning their numbers, or what those numbers mean, this is a great program to start with! Not only is it comprehensive, in-depth and detailed, but it is also designed with 5 year old attention spans in mind. The lessons do not take long and are very hands on. It is affordable, it is fun, and it is super easy to open and go for mom! How do I know if my child is ready for this? We all know that children grow and develop at their own rate and age isn’t the only factor to determine a child’s readiness for a particular program. After looking through this curriculum I would say that your child needs to have the fine motor skills to be able to copy their numbers. They don’t need to 100% grasp the concept of the value of these numbers, as that will be introduced right from day one but they do need to have the ability to write their numbers. If your child doesn’t have the attention span to sit for a few minutes or gets overwhelmed with pencil grip, it might be worth waiting a few months or even a year to give them a bit more time to develop. Starting any program too early can cause our kids to get frustrated and overwhelmed with the idea of learning rather than excited and enthusiastic. Check out the live video I did to show you inside the program and how it works! So here it is, a special offer! On Thursday, September 14th at 10am PST/1pm EST I am going to be doing a live video showing you inside this Kindergarten Math curriculum and explaining how it all works in detail so if you have more questions or aren’t 100% convinced, come join me on my Facebook page at that time for a full overview of the program or join the event for more info (and to get notified of when it is happening). For those of you who just can’t wait, I have two coupon codes for you! Choose the one that meets your needs (cannot be combined) and head on over to The Crafty Classroom to redeem your offer! Codes will expire on September 30th so snag your copy now! Purchase our R.E.A.D. 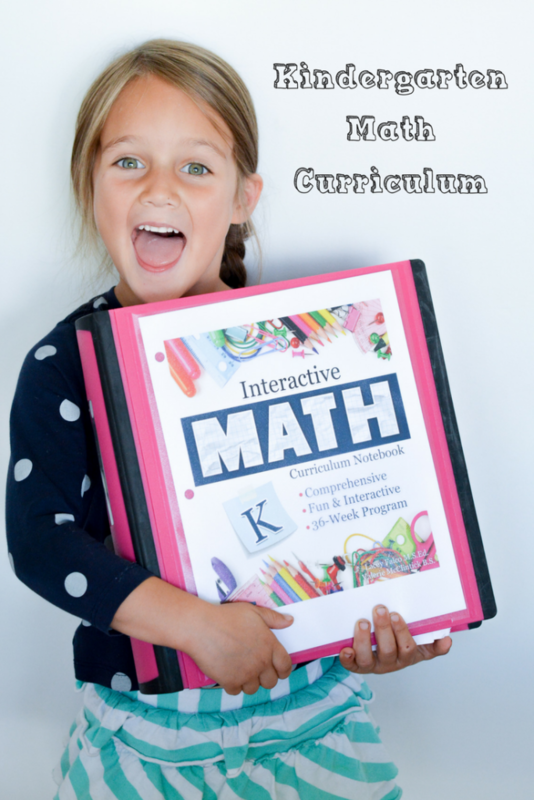 Curriculum Notebook as well as our Interactive Math Curriculum and use code KinderFreebie. We’ll automatically add our $15 R.E.A.D. Review Pack for FREE. Cannot be combined with any other offers. For those that already own READ or don’t need a reading curriculum, we are also offering a coupon code that will take 15% off the entire cart. Cannot be combined with the above offer or any other offers. And if you aren’t familiar with The Crafty Classroom, you need to check out some of the different programs and resources that they offer, they have Science, Bible, Social Studies and more available on their site! I just bought the curriculum four-day through your link but didn’t see these offers! Is there a way to still qualify if I provide my order number? Hi. I’m a bit confused…is the FB live on Thursday or September 13? I am looking forward to watching!! The ‘KINDERFREEBIE’ code is misleading, you have to spend $50 or more to use it. What’s the 15% off code?